Since its launch, Google Chrome has been a full featured web browser with a very simple user interface. What this means in practice is that you can get your job done, but you wouldn't have any of the niceties provided by Firefox, such as themes and other methods of user experience customization. 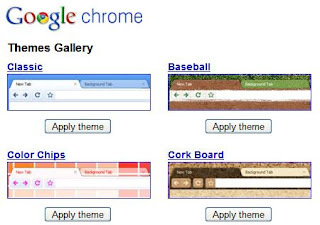 Version 3.0 of Chrome, however, is trying to change this with the addition of themes. There is even a set of themes that have been specially created for this launch (see link bellow). As a long time user of Chrome, I think that the current default theme is just as nice (in fact, version 3.0 made some subtle improvements on it. However, it is great that we have choice, so if you are not comfortable with the default options, you can even create a new theme and make it available to everyone.